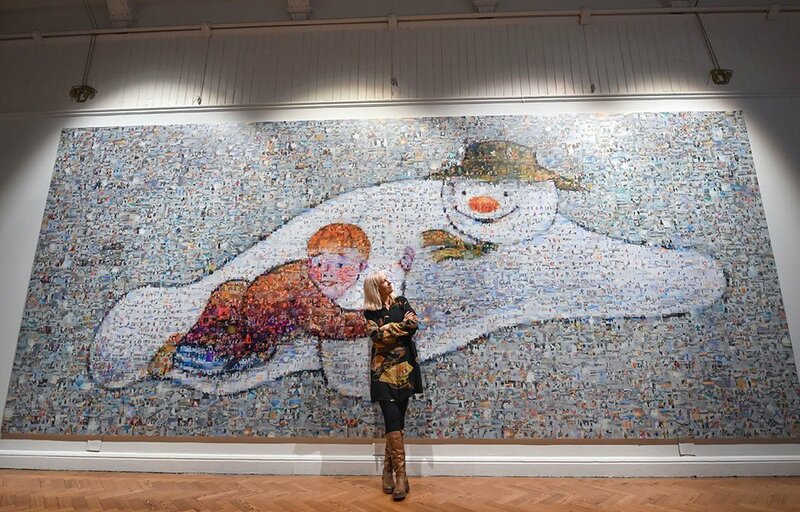 A new festive public art project has been unveiled in Brighton Museum to celebrate Raymond Briggs’ much-loved work, The Snowman. Marking the story’s 40th anniversary, a giant mosaic of the unforgettable ‘flying scene’ has been created, using thousands of individual festive photos. Penguin Ventures (part of Penguin Random House) has partnered with The Peoples Picture to create My Snowman by artist Helen Marshall and celebrate the enduring Christmas classic. This new image of the Snowman flying through the skies will be on show until Sun 6 Jan at Brighton Museum & Art Gallery, complementing an exhibition of Raymond Briggs’ original artworks. A digital version of the mosaic has also launched online, allowing participants to zoom in and find their own photograph. The Snowman was created by Briggs in 1978. Narrated through his wonderful hand-drawn illustrations; it tells the magical story of a boy whose snowman comes to life. Loved by generations, fans of The Snowman have been invited to upload photographs of their fondest festive memories or moments from the past 40 years to form this giant tribute piece. 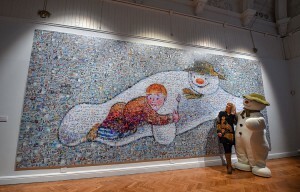 “I have really enjoyed seeing everybody’s submissions roll in one by one for My Snowman,” says The People’s Picture founder, Helen Marshall (above).” The pictures, as a whole, reveal the full range of human emotion expressing love, loss and celebration which are the ultimate themes of The Snowman story. The final artwork will be donated to Raymond’s charity of choice, Chestnut Tree House. It will then be auctioned off as part of their annual festive fundraising initiative. Chestnut Tree House is a children’s charity providing hospice care services and community support for children and young people with progressive life-shortening conditions throughout East and West Sussex, Brighton & Hove and South East Hampshire.